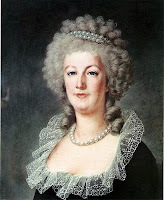 On Life, Love & Accidental Adventures: Am I Related To Marie Antoinette? I have often fantasized that a long lost relative would bequeath me an old chest crammed with treasured family documents. Hidden between a stack of love letters and a scrapbook filled with momentos would be the document that would provide the irrefutable proof linking me to my idol, Marie Antoinette. So when I saw an advertisement from the DNA Ancestry Project promising to trace my genetic history I became crazy excited. "With a simple swab of your mouth, you can be compared with Marie Antoinette and discover your relation to her. You will be able to trace your heritage back to times of grandeur, to times of kings and queens and royal balls, and possibly even to Marie Antoinette." I clicked over to Genelab's website and read more about the DNA Ancestry Project. An article posted there indicates that recent DNA tests on a lock of Marie Antoinette's hair have provided scientists with data that will help connect the queen to people living today. The big, bold link at the end of the article said FIND OUT IF YOU ARE RELATED TO MARIE ANTOINETTE. I nearly fell down the stairs in my mad dash to retreive my credit card. A moment later, credit card in hand, I clicked on the link. After filling out my basic information, I came to a series of choices. Did I want the Standard Paternal Ancestry Package or the Advanced Parternal Ancestry Package? The former said it included a Y-DNA 20 marker test whereas the latter promised a Y-DNA 44 marker test. I also had the option to check my maternal DNA with an HVR 1 or 2 test. I was tempted to choose the Advanced Combo Package which promised a high resolution test for tracing my ancestry on my paternal and maternal lines, but that test cost several hundred dollars. Confused and concerned about the cash commitment, my excitement started to wane. I mean, I could buy 212 of Marie Antoinette's favorite cream puffs from Stohrer Patisserie in Paris for the cost of the Advanced Combo Package. I decided to do some more research on DNA testing for Genetic Ancestry Reseach and discovered that most of the companies promise more than they can deliver. For instance, it is possible to trace your deep ancestral roots and discover which ethnic, haplogroup you came from, but it is more difficult to trace your shallower roots because the gentic ancestry database is not complete. In the end, I decided the answer to my burning question (Am I, indeed, related to Marie Antoinette?) would have to wait a few more years until the genetic ancestry database increased. In the meantime, I will continue to imagine my previous life as Marie Antoinette's most trusted courtier. I will imagine myself wearing a blue silken gown, powdered wig, and pox patch, gliding through the Hall of Mirrors, a bichon frise snapping at my red-soled heels. If you would like to pay big bucks to trace your ancestry and find which haplogroup you originated from, pleaes click here. If you would like to watch a report about the inaccuracies in the promises made by genetic testing facilities, click here. If you would like to read a good review aboutu Genebase, written by someone who paid the money to have her ancestry traced, click here. I still think it would be interesting to see what they came up with, though I am proud to see the practical side check out Genebase before shelling out. I think we all know in our hearts that you are at least the very least the most favored descendant of MA (and if reincarnation exists, there's no doubt your endured your moment at the guillotine). You do have a lot in common with Marie Antoinette. You should write a book about her. I don't know that much about this time period, but you certainly make me want to learn more. You seem to know A LOT about Marie Antoinette and this time, any suggestions on books to check out? There are several good broad-sweeping biographies about Marie Antoinette. I prefer To The Scaffold by Carolly Erickson and Louis and Antoinette by Vincent Cronin. I, myself, prefer to read contemporary journals or memoirs written by people who knew her. A Journal of the Terror by Louis XVI's valet is particularly engrossing. Madame Campan (her modiste) and Elizabeth Vigee-Lebrun (court painter) both wrote memoirs that detail Marie Antoinette's life at Versailles. If you are looking for something more academic - Simon Schama's Citizens is about the best (and at over 500 pages, it is a committment). Although I have read several novels about Marie Antoinette, I have yet to find one that fully fleshes her multi-faceted character. Frankly, and I know I am biased, my novel, The Queen's Folly is the best for showing her true personality. Hopefully it will be published someday soon. While I don't believe in reincarnation, it is curious, the way we sometimes feel mysteriously connected to people in different times and places. I'm glad to have found your blog, it's lovely. heyy im related to King Louis the 16! all though im haitian but my great grandfather was from Canada. And he is French Canadian. And research proves that the family ran away when the royal family were being beheaded. So we might just be related as well! How interesting, Leah! I have weird connections with 17th century France. I was told repeatedly at school that a lot of the nouns I used were dating from then and they came from my unconscious mind. They had not been learned. I love that period of UK and French history. When we went to Fontainbleau, I knew it and when we went to Vaux-Le-Vicomte, I felt I was home.Its really odd. Fiz ~ I get you, completely. Perhaps you and I are recycled souls, from another time. It's grand to imagine, isn't it? i might be too though! but i am trying to find out more!